The plight of college students in deep credit card debt is reported in the media almost daily, but for many young people, credit card issues begin in high school, not college. Should teens have credit cards? According to the Jump$tart Coalition, an advocate for financial literacy, one in every three high school seniors uses credit cards. Teens today are consumers, pumping billions of dollars into the economy, so there's something to be said about teaching them to use credit cards responsibly before they go off to college or out on their own. 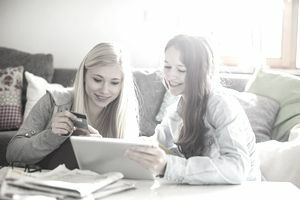 They, and not their parents, should write the check that pays the teen's monthly credit card balance, so the teen understands the connection between cash and credit and how one affects the other. Teens should keep a record of the credit card purchases they've made during the month, with a running total. When they've reached the amount they can afford to pay off at the end of the month, they should stop using the card until the next month rolls around. Parents and teens should discuss what types of purchases are appropriate with a credit card. For example, appropriate purchases do not include anything you can eat, drink, or wear. To compare offers on student credit card deals, go to BankRate's Web site (www.bankrate.com) and search for "Student Credit Cards." When evaluating credit card offers, get everything in writing and read all the details, especially the fine print. Prepaid credit cards are a good alternative to regular credit cards for teens and can serve as a type of training wheels to ease young people into using credit wisely. Visa Buxx is one such card, which allows parents to limit spending by funding the credit card via transfers from their checking account to the card. They can monitor their teen's spending on the card with monthly statements or online. The best way to fund a prepaid card is with the teen's own money (they can give you some of the cash they acquire through allowances, jobs, or gifts, and you can fund the card with it). When choosing a prepaid card, look out for fees. Some credit card companies nickel and dime you to death before you've even made a purchase. Low-limit credit cards are another alternative. Parent's co-sign with their teen on these cards and set a low credit limit of $200 to $300. Should You Bail Your Teen Out? Parents who bail their teens out when they get in over their head with credit are not doing their kids any favors in the long run. It's better to be involved enough with your teen's credit use to be able to nip potential problems in the bud rather than give your teens the message that they can use credit irresponsibly and not pay the consequences. Credit cards should be viewed as a convenience and not an extension of income. The goal is for teens to learn to use credit cards as a tool, not as a crutch.